Field test of the gorgeous, ambitious wide-aperture tele macro by Sigma. Thanks to a kind loan by Mauro Maratta, I had the chance to fulfill a wish: trying the Sigma 180mm f2.8 Macro OS on the field, and thus here are my impressions on that lens for what concerns macrophotography. 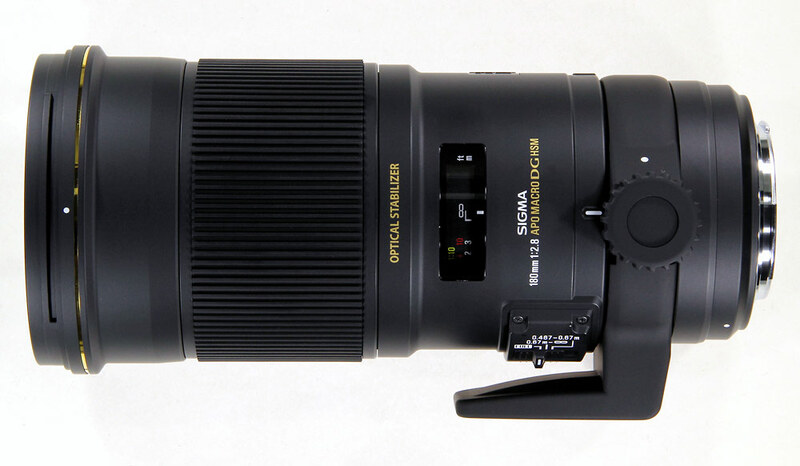 Here on Nikonland it has been already written about this lens. Bruno Mora wrote an in-depth analysis from the point of view of construction and optical rendition, and also made a mini- comparison with the Nikon Micro-nikkor 200mm f4 IF ED. I will try to complement what Bruno wrote, with my impressions about field use in macro photography. The 180mm f2.8 Macro OS, as Sigma says, is the only tele-macro of large aperture that reaches a reproduction ratio (RR) of 1:1, and this is true. Sigma several yeras ago, made another 180mm f2.8 Macro, but it reached only a RR of 1:2 (0,5) and it was a real nightmare as for ergonomy, weight and Af speed were concerned. 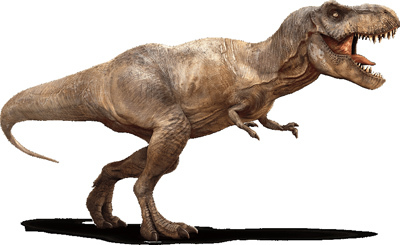 Decades ago Tyrannosaurus, like most other Dinosaurs, was seen as a slow, cumbersome giant, unfitted for survival; while now, after Dinosaur Renaissance in science and a few Jurassic Park in the movies, we see Tyrannosaurus like an awesome, powerful and sleek animal (despite its size). Well, the same happened with the 180mm Sigma f2.8! I never shoot with the old 180 Sigma f2.8 Macro (keeping it in hand and hearing the af sound in a shop was enough...) thus I cannot judge its optical quality. But let's come back to the new Sigma 180 f2.8 Macro OS: it's huge, being as big as the older incarnation, a real dinosaur among macro lenses, but it is built in a completely different, and immeasurably better, way. It is a modern lens, well balanced and equipped of a detachable tripod collar that makes sense contary to the ergonomical hallucination one of the old one. Lens hood is really big, and doubled, a first section to be used on full format cameras and a second part to be added when the lens is used with an APS-C camera. Even the first part is a bit too large to be practical, at least for macrophotography. The focus distance window has the distances marked in feet and meters and, like in any macro worth the name, there is also the reproduction ratio at shorter distances. From these data, with few calculations it is possible to know the actual focal length at different reproduction ratios and consequently at different focusing distances. 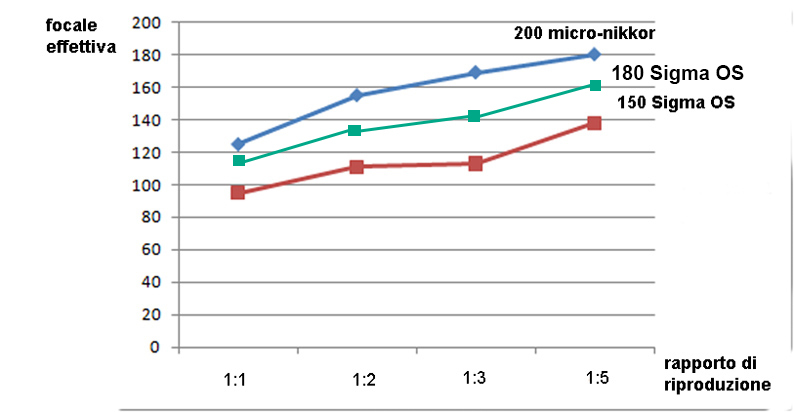 As usual by now (this doesn't mean it's a good thing anyway), actual focal length decreases approaching the minimum focusing distance. At 47cm it becomes 117mm. In macro it is even more imoprtant the working distance (the distance between the subject and the front lens). With the same focusing distance a lens with lower working distance (e. g. because the lens barrell extends a lot at short distances) will be less practical than one with a grater working distance, and there will be more chances to scare the subject if the latter is animated and mobile. The greater working distance is one of the main reasons that make many macrophotographer (me included) to prefer "long" tele macros (180-200mm) with respect to more moderate 90-105mm macros. 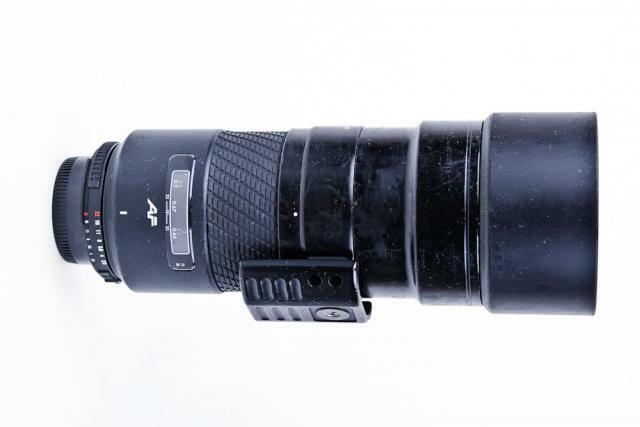 The Nikon 200mm f4 micro-nikkor AfD ED has a working distance of 26cm. These values are referred to the sole lens without the hood, that in the case of the two Sigma 180mm are rather huge, or really huge. 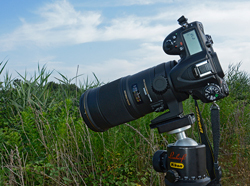 As far as the working distance is concerned, the 200mm f4 micro-nikkor has a clear advantage. 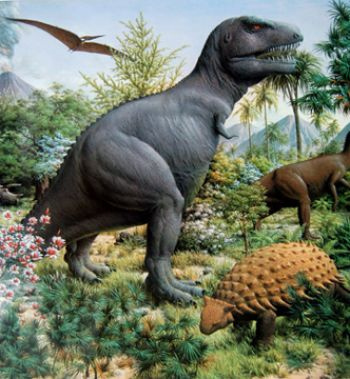 But, even if longer is better, there are other variables into play, as we will see. The wide aperture makes the new Sigma 180 very useful also for portraits and general photography, while it is not so much important for macrophotography, where depth of field is always very small. It allows however to use a converter without losing too much f/stops, that may be of help for precise focusing. 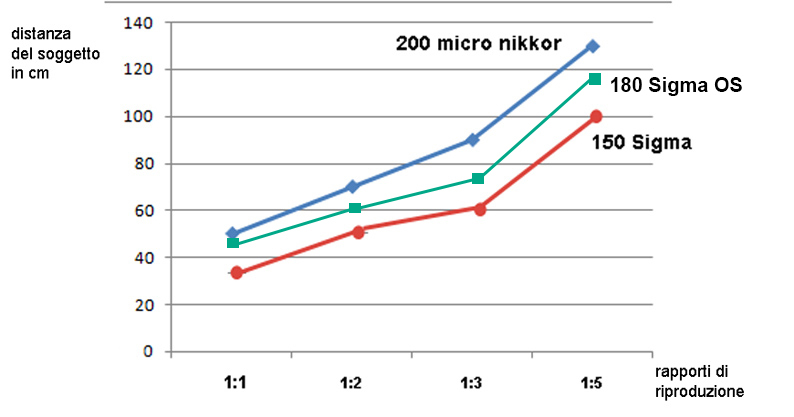 As for all other macro lenses, actual aperture decreases at shorter distance, becoming f3.2 at 1,5m, f3.5 at 90cm, f4 at 80cm and f5 at shorter distances. The actual f/stop value appears on the camera display and in the exif data.